The Universal Hammock Stand with Double Hammock is our top choice for combos. The double hammock is made with 100% cotton, creating a comfortable refuge for an afternoon snuggle. 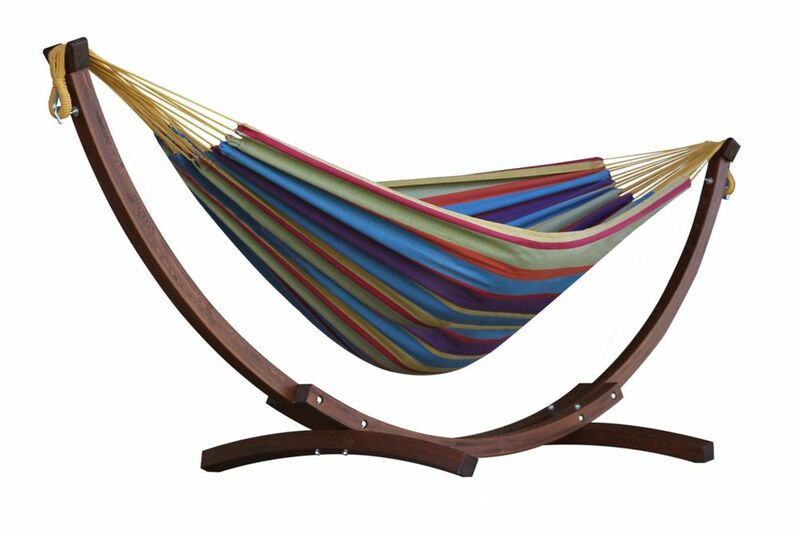 The hammock stand is constructed of heavy duty steel and assembles in minutes without any tools. Plastic caps are used on the ends of the steel tubing to create a soft finish. You will enjoy the freedom the stand provides by allowing you to set up your hammock in the most convenient location and no longer rely on those 2 perfect trees. 8 ft. Double Cotton Hammock in Tropical with Solid Pine Arc Stand Eye catching solid wood frames sets this Double Cotton Hammock with Solid Pine Stand apart from the crowd. It is a natural choice for a rugged design aesthetic or will compliment an immaculate manicured space. The stand provides durability and the densely woven double cotton hammock comes in the spectacular Vivere colours that you've grown to love. Or, a solid, neutral option keeps your space classic. 8 ft. Double Cotton Hammock in Tropical with Solid Pine Arc Stand is rated 5.0 out of 5 by 1. Rated 5 out of 5 by Happycamper from Easy set up, great materials. Good quality product. Not oversize, does not take up too much spac... Easy set up, great materials. Good quality product. Not oversize, does not take up too much space. A 1 person hammock, not for 2 people.